I was doing some specific tests in my TOFFEE and TOFFEE-DataCenter (WAN optimization) scenarios such as variable upload and download speeds. And I was also doing some experiments with speedtest.net and I did some of these tests with TOFFEE-Mocha. I realized there is a case that I can introduce asymmetric constant delays so that you can get different download speed and a different upload speed. And in some cases much faster download speeds and relatively slower upload speeds. 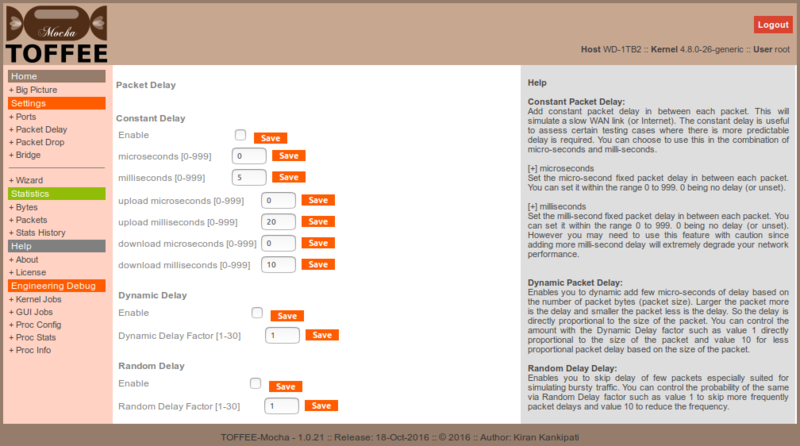 What I did in this version is that I extended the constant delay feature of TOFFEE-Mocha. Added a new variable to enable or disable the overall constant delay factor. So with this option you can now completely enable the constant delay or completely disable the same. It will still contain the old milli-seconds and micro-seconds delay which will add constant delay for each packet irrespective of its direction. And along with that it will include the new upload milli-seconds, micro-seconds and download milli-seconds, micro-seconds delay variables which will add delay respectively to upload/uplink (LAN to WAN) packets and download/downlink (WAN to LAN) packets. If you set any of these (upload/download) delay parameters along with standard delay (milli-seconds, micro-seconds) then it is going to be a summation of overall delay. So from this version of TOFFEE-Mocha it is going to have a distinct LAN port and a distinct WAN port unlike earlier versions. If you see in my earlier documents (as well as news updates) I mentioned in the user guide stating that: "IMPORTANT NOTE: Since TOFFEE-Mocha device is a WAN emulator device you can configure any port as LAN port and WAN port. Swapping LAN and WAN ports in your deployment will not cause any issues." But not a case anymore starting from this version which should be released very soon. So this way you can add asymmetric delays which is a great tool when you are doing systematic tests and research scenarios such as fine-tuning your WAN Optimization device, a network test lab setup, investigating TCP acceleration parameters, TCP optimization and things like that. Strangely with some experiments with TOFFEE-Mocha I have even managed to get better TCP performance and ratings in my speedtest.net test results. Since essentially I am finding ways to optimize TCP Window scaling and make packet drop happen within LAN and self adjust TCP window/throttle rather than packets getting dropped in the WAN network (or Internet). Not only this will save your bandwidth but with this technique it may improve overall end-to-end network performance and higher bandwidth rates.